Red Carpet Tiles – At Carpet Tiles Next Day we stock a small but fine selection of red carpet tiles. They are all hard wearing and low maintenance carpet tiles and are the perfect choices for all customers wishing for a red option for their industrial property, public meeting places or domestic environments. Manufactured in 100% polypropylene all the red shades and pile types are stain resistant, tiles may be lifted cleaned and replaced when necessary making your flooring look first-class for longer. We also offer a choice of three pile types, enabling us to fulfil most needs. All of our carpet tiles are 50cm x 50cm and are sold in boxes of 20 tiles, each box contains 5m2. The Red Carpet Tiles that we have on offer are all produced using 100% polypropylene; it is this fibre that creates the easy maintenance and long lasting properties of our carpet tiles. Polypropylene is stain resistant, when faced with soiling, the individual squares may be lifted, washed down, dried and replaced prolonging their life. No underlay is needed with our red selection as they are all backed with a 3mm layer of bitumen; this also makes them a suitable choice of flooring for low level sound deadening. Our value end colour red are the Lava Red, these are velour carpet tiles. This type of needle-punch pile tile is often chosen for high traffic hallways, walkways and corridors but may be used just as successfully for rooms in domestic residences. They are easy on the eye and the pocket, therefore are a go-to product for churches, clubs or charity buildings where the budget may be limited. Lava Red are a robust choice, offering a two tone mid red shade mix, which will supply a smart, long-lasting flooring which will harmonise with most colour schemes. Our low-priced red is the Nebular Red, this is a mid tone in the Red shades. These carpet tiles are from our Fine Rib Range, as with all the polypropylene carpet tiles they are a durable option for your floor, amongst our past customers we have sold these carpet tiles to retail shops, or for use on exhibition stands and other heavy foot traffic situations. The fine rib are ideal for combining colours, the other colour choices lay well together giving a unique look to your works space or corridors. Why not mark out a specific walkway giving a contemporary feel to your room. Our mid-priced choice of red are the Rivoli Red carpet tiles, these are a loop pile tile. When these carpet tiles are laid they can give the appearance of carpet, while still offering the versatility and easy maintenance qualities of carpet tiles. Simple to keep clean these are a nice red option for conference, meeting rooms or entrance halls, or for in the home environment, an agreeable addition to your garden room, kitchen or dining area. The Rivoli Red has a reddy/orange base colour with a dark coloured fleck which blends to provide a very classy carpet tile. As with our other red choices, they benefit from the stain resistant qualities provided by the polypropylene fibre used in manufacture. 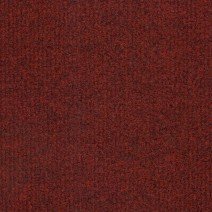 In our nylon range we carry two choices in red carpet tiles, the first being Admiral Red, this is a rich red speckled with a burgundy tone and a black low-light, the second is our Geneva Terracotta. This is our cut pile nylon selection, as the name suggests this is a reddy brown colour, both tiles have the added benefit of being produced in the softer and even more durable nylon yarn. The nylon fibres of these carpet tiles have the ability to spring back into place when pressure is released, so the flattening that will eventually occur with the polypropylene tiles after several years, will be delayed even longer with the use of these carpet tiles. Carpet tiles are quite easy to fit and we find that the work is often performed by the purchaser themselves; we have a downloadable PDF fitting guide on the website to help you along your way. However larger areas are probably best laid by a professional. All of our carpet tiles can be either loose laid or stuck down. For small areas of less than 100 tiles loose laying is acceptable, perhaps using the double sided carpet tape near doorways for safety. If laid in a heavy traffic area, the tape should be used to prevent trip hazards. For larger areas we would recommend using the carpet tile tackifier. This is a special liquid form (pressure sensitive) adhesive which allows the lifting of the carpet tiles for cleaning and replacing, while preventing any lateral movement. Both products are available for purchase on our site, as is a fitting kit for those who do not have the correct tools at hand.